The semester is finally winding down for me, and I am almost on Summer Break! This year has definitely gone by the fastest out of my college career – I can hardly believe I am about to be a senior. 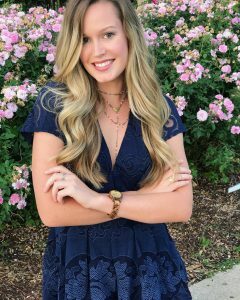 Today I am collaborating with JORD Watches to bring to show you the perfect watch for Spring and Summer! Don’t forget to stick around till the end of the post for a GIVEAWAY. Everyone who enters will get $25 credit, and one lucky winner will get $100 dollars towards a JORD watch! How cool is that?! 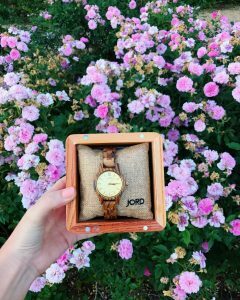 If you’re like me and always overthink gift-giving, JORD watches are the solution to all your problems (no, seriously). 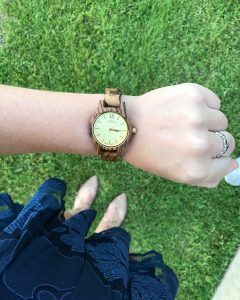 Their natural wood watches are so unique and would be the perfect gift for Mother’s Day, Fathers Day, an anniversary…you name it!I have been eyeing their watches for a while so I was so excited when they reached out to me to review one of their watches! The watch I am wearing below is from the Frankie 35 series in the color Zebrawood and Champagne. 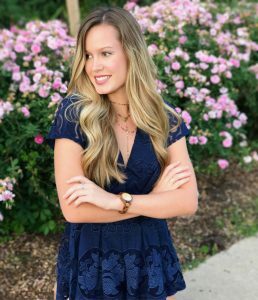 Let me tell you y’all, this watch is so lightweight and comfortable – it is the perfect staple everyday accessory for Spring and Summer! You can my watch here. Today, I decided to pair this look with this fun and flirty peplum romper. I love that this watch is so simple an elegant which makes it easy to dress up or down for any occasion! I also love to style this watch with some boyfriend jeans, graphic tee, and baseball cap for a casual look. The great thing about this watch it that it is so versatile and can be paired with almost any look! To enter the giveaway for $100 gift code to use on the JORD site, all you have to do is click here. (It takes maybe 10 seconds to enter!) The giveaway ends May 28 at 11:59 pm, and EVERYONE who enters will get $25 credit to JORD!